Short profiles of some of the biggest and most innovative entrepreneurs. A flamboyant British entrepreneur known for his promotional antics seems too strong an inspiration for an essay on India's new business families. But Richard Branson's words - if not actions - sum up the way these businessmen grabbed opportunities in the liberalised India of the 1990s and later. "Business opportunities are like buses, there's always another one coming," Branson has said. The end of the licence-permit regime in the 1990s ensured that there are enough buses plying on the road to economic growth. Many of the business dynasties such as the Shrirams, Wadias, Modis, Mafatlals and Lalbhais, which had ruled so far, got relegated to the background. It was the Mittals, Biyanis, Tantis and Agarwals who spotted the opportunities and acted on them to make it big over the past two decades. Those profiled here modestly declined to be interviewed for this report. Take Sunil Mittal . Starting with the manufacture of bicycle crankshafts in 1976, he tried his hand at several unrelated ventures including a failed bid for a Maruti dealership, till he struck a goldmine in the telecom business. And not by making India's first push-button telephones. In 1992, he bid for the licence to provide mobile telephony services in the Delhi circle. Two years later, he secured the rights for it and began laying the foundation for Bharti Airtel, today the country's largest mobile telephony operator. (At last count, Bharti Airtel had over 158 million subscribers and a market capitalisation of Rs 1.2 trillion.) Shortly after getting the licence, he was invited to dinner by a industrialist with interests in automobiles. The host suggested that Mittal sell the Delhi licence for "Rs 10-20 crore". Mittal recounts how he grit his teeth and said goodbye. That industrialist, or rather his son, today runs a tractor business, while Mittal and his brothers count $8 billion, or Rs 36,000 crore, and change as their net worth. Mittal, whose brothers Rakesh and Rajan are with him in the business, has also gotten into retail, agriculture, insurance and entertainment by forming joint ventures with some of the giants of the western world -Walmart, AXA Group and EL Rothschild Ltd. In 2010, he snapped up the African operations of mobile telephony player Zain for $10.7 billion. Bharti Airtel became the world's fifth largest telecom operator. Pulling off a successful business is just one part of his personality. As the business grew rapidly, Mittal spent plenty of time and effort in hiring professional managers to run his companies. If Mittal is king of the spectrum, Subhash Chandra of Zee Group rules satellite broadcasting. Joining the family's rice trading business at 17, he ventured out on his own in 1983 and introduced Indians to laminated tubes and packaging. His next venture, EsselWorld amusement park, prompted him to reach for the sky. By 1992, Chandra launched Zee TV, the first private television channel. Currently, the group has interests across diverse areas such as entertainment, education, packaging, wellness and broadcasting with a combined market capitalisation of Rs 20,987 crore. 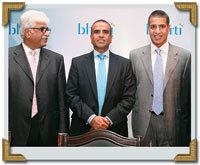 Last November, when he turned 60, Chandra decided to pass on the baton to sons Punit and Amit Goenka. 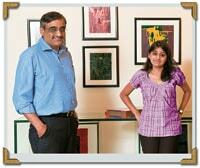 Then there is Kishore Biyani, CEO of Future Group. Born into a middle class Marwari trading family, Biyani saw the future in modern retail in the late 1990s by launching ready-to-wear branded trousers through Pantaloons stores at a time when most Indians depended on tailors. From there, it was a hop, step and jump into fullfledged retail, from lifestyle (Pantaloons) to household (Big Bazaar). Today, the parent Future Group operates around 1,000 outlets in 71 cities across multiple formats, many of which are Biyani's innovations rather than Western templates. While retail remains the core, the Rs 10,000-crore group has been entering other high-margin sectors such as financial services, telecom, consumer durables and fast-moving consumer goods as well. New problems need new solutions. When Tulsi Tanti began facing difficulties in his textiles business because of erratic and costly power supplies, he found the answer blowing in the wind. He set up two wind-powered turbines for his textiles plant in Gujarat. Renewable energy was then largely unheard of in India. The initial cost was high but he quickly realised the longterm competitiveness of wind energy. In 1995, Suzlon was born with just 20 people. In less than 15 years, it has become the third-biggest manufacturer of wind turbines in the world. Tulsi Tanti today lords over a Rs 20,000-crore group employing more than 16,000 people with operations across the Americas, Asia, Australia and Europe. Although Suzlon currently is battling debt and the competition, Tanti seems to be unperturbed about the future of his business. Not all are into sunrise sectors. Anil Agarwal of Vedanta Resources has grown huge empires out of dirty and old-fashioned businesses such as mining and smelting. Starting off as a scrap trader in Mumbai some 30 years ago, he was quick to spot companies going cheap. In 1983, he anticipated a huge copper demand from the telecommunications industry and acquired a closed-down copper-cable maker in the United States. He also entered other metals such as aluminium and zinc. Today, Agarwal is among the richest metals magnates in the world.